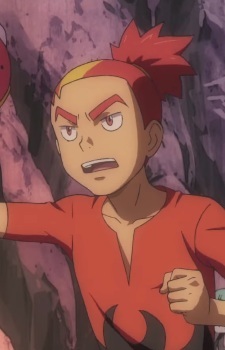 Buck made his anime appearance in episode 181 when Ash and his friends were on the ferry bound for Suzuran Island. Unlike the other passengers who were headed for the Sinnoh League, Buck was actually traveling to a nearby island looking for treasures alongside his partner Baltoy. Buck was a treasure hunter, who had found many rarities in the past thanks to Baltoy's senses. With the help of Ash and the others, Buck was able to find the island's treasure and also managed to capture a powerful Claydol.